Yesterday we all worked like crazy. Somehow Thursday manages to slip itself in every time we have those events - and it is a stern reminder that we ought to get closer to completion of a chair or two. Ty needed to get some really precise holes drilled in his frame assembly. My pillar drill is incredibly inaccurate, and those holes were sort of make it or break it for the project- As luck would have it, Olav had acquired a professional pillar drill /milling machine some time ago, and we drove to the workshop where it still is. (He hasn't moved it home yet). This machine was up to the task and I am a quite a bit jealous at Olav for having such a nice machine. Brian started adzing out his seat, and he has made good progress. I worked on the seat and got all the holes laid out and drilled. Next I made the legs and that was done with the copy attachment on my lathe. This attachment works really well, and the whitebeam gave a nice surface. I am not a fast turner, but using this attachment made it both fast and I ended up having four identical looking legs. Olav continued on the shaving horse, and was mostly occupied in making huge mortises in the base and the upper rest part. Drilling on the Arboga drilling machine. 14.7 degrees really is possible with this machine! Drilling holes in the seat. My drilling guide for ensuring 7 degrees holes. Turning a leg with the copy attachment. Oh heck, is it already Wednesday! I feel that I should be half done with the chair by now, because clearly Ray is able to complete the chair from starting out quietly Monday morning and being all done on Wednesday. At least that is what I imagine from his blog post (I have very high thoughts on Rays work as you might have guessed). Well my Wednesday saw me completing the sack back bend, and from then on it was spindle making time. There are 28 short spindles and 7 long ones. I discovered that I could make them much faster and better looking using a spokeshave than I could on the lathe. Before calling it a day, I started sanding them, but I didn't get all of them done, so I'll have to continue with that today. Generally there has been a steady progress on everyone's projects, and it is interesting to watch the different techniques employed at each participant's workbench. Short spindles pre tapered on the jointer. Bending the sack back piece. A few of the short spindles have been rounded. Setup for rounding over the short spindles. Detail of Ty's chair plan. I made a bending form for the sack back and then I readjusted the bending form for the arm crest, so it would fit the plans I got from Ray Schwanenberger. The sack back bending from is advanced for me, because you need to bend it in two planes. I made three attempts at that, but all of them broke. So I'll have to see if I can get it done today. Of other things I managed to flatten the seat for the chair/cradle and I made a run of the short spindles that I tapered. But there is still a bit of a way to go. Everyone else in the shop seems to be making great progress, which is really nice, because it means that as a whole, we are all getting better at building chairs. Seat blank after some exercise. Arm crest bend clamped to the bending form. DCBE day minus 1, Olav and I drove to Aalborg Airport to pick up Brian Eve. We had a great ride home and Brian was impressed that the Danish legislation allows you to drink a beer while inside the car. Even the driver can have a beer, just as long as he/she stays below the BAC limit of 0.5 per mille. Earlier that day, I had picked up the extra workbenches at Olavs place, and Olav and I helped each other unloading them at my shop, so all was ready for building some chairs. The first day started with going through the stock of wide boards and determining which things we wanted to build. Brian has decided to make a Velda's rocker, Olav wants to make a shaving horse, Ty is doing a new design and I am going to attempt making a sack back nanny rocker. Ray Schwanenberger had graciously offered to send me a copy of the plans for his nanny rocker. They were scheduled to arrive Saturday, but thanks to the incompetence, lack of service and skills by the Danish Mail (which is now called Post Nord), the planes didn't arrive until Monday afternoon. Fearing that the plans might not arrive until the end of the week, I started designing my own nanny rocker. I made it as far as building a bending form for the arm crest, and then suddenly the real plans were available to me. Those plans are spectacular - nothing less!. I decided to ditch my own design and follow the plans, then I would know that the concept would work and I can always try out my own design when I have built my first NR (nanny rocker). So I sort of started from the beginning again in the early evening, so that's why I haven't got a lot of impressive stuff to show. In addition to this I forgot to take a lot of pictures during the day.. I found some use for my drafting whales! The first attempt of a bending form. I'm signing off tomorrow afternoon, so I should be home early Wednesday morning. That will give me a bit of time for preparing the oncoming DCBE. There are a couple of things that needs to be done prior to getting the shop filled with people. First I have to remove Gustav's mopeds from the shop, and also the motorcycle lift that is currently residing in one part of the shop. Then I need to do a thorough clearing up and cleaning, so it will look nice an inviting. I'll have to arrange with Olav to pick up some extra workbenches, and have those put in the shop as well. There is likely going to be some steam bending this time, so I have decided to make a proper steam box, instead of relying on my old gutter pipe balancing on top of a micro deep fat fryer. There was one sheet of plywood left over from building the two Mini Max hydroplanes, and that should be sufficient for a steam box. I need to buy a wall paper steamer for supplying the actual steam, but I think that they have those at at the local home center. I would like to make some sort of kiln as well, but I am not completely sure if I'll do it from scratch. An idea that has crossed my mind is to just get my hands on an old cabinet and install a heater inside that. But I think the steam box is more important, so the kiln might just have to wait. In a pinch it should be possible to stack some insulation around an old table, and then put the heater below that. So given that there are a bit more options for that I am not so worried about the kiln. I need to go and talk to the caterer, and discuss a menu for the week, and agree on when I should come and pick up the food. That is a very important thing, since we need to be well fed to yield maximum power! Due to the planned return to chairs featuring some turnings, I thought that it might be a good idea to see if I could get my act together, and install an electric motor on an old wooden lathe that I bought at an auction in Sweden maybe 15 years ago. I don't want to make a foundation for it, so it will just be clamped to my workbench. That way there shouldn't be a traffic cork for a lathe when the need arises. As usual I am probably way too optimistic regarding how much I am able to achieve in a few days, considering that I also plan on talking Bertha for long walks, ride in the forest with Mette, and I have signed up to chaperone the first school dance at Gustav's boarding school. But on the other hand, once in a while I am actually able to impress myself with being efficient, and I hope I will be able to do just that this time too. 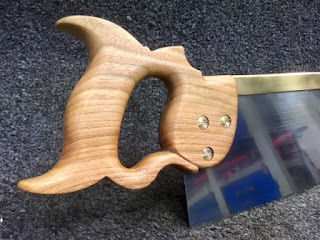 Making a tenon saw 2, saw completed. Fabricating the handle was just like what I did for the Simpson saw, but I had planed a little bit more of the blank before starting. something like 1 mm (5/128"), which makes the handle a bit more comfortable in my opinion. The screws that Pedder had sent along were of a much stouter type than the ones on the old saw. In addition to that, they also happened to be metric which made it a whole lot easier finding a drill that corresponded to their size. Drilling the holes in the saw plate was kind of hard, since the steel is just a bit on the hard side for a regular drill to go through. A really good drill press helps, but I still had to regrind the drill one time. I started with a small drill, and made it up to the correct size in the next step. Due to my reopening of the spine, the saw plate slid in place without any hick ups. The handle was sanded and smoothed with some steel wool, and then I gave it two coats of varnish where I wiped off the excess after each time and followed up with some steel wool to give a matte surface. I had a feeling that the spine and plate were not completely in line with the center line of the handle. So I checked it and it seems that I was correct. Over the total length of the saw the plate/spine bends 0.8 mm farther to the right than to the left. This is over a length of 43 cm, so using a cotangent function I was able to establish that the angle was 0.107 degrees off to the left. With the risk of being called a crude worker with sloppy results and no regard whatsoever for precision, I have to admit that I can live with that. It wasn't enough to get my fired up for making a new handle. My guess is that it is some sort of optical illusion due to the grain lines on top of the handle that causes the eye to think that it is all crooked. I tested the saw for a couple of cuts, and it cuts beautifully. No tendencies to wander off or pull to one side. But I attribute all this more to the sharpening of the saw than to the handle and spine. Making a saw handle is not that hard. Making a nice looking handle on the other hand takes a long time. Making a really nice almost perfect handle is a lot of work, and takes a lot of time. I think I ended up in category number two. It is nice but it isn't perfect. The spine ended up looking fine, but again not perfect, It is not completely symmetrical but that was due to how I bent it. For me the most fun is in shaping the handle. Bending the spine and filing the teeth are just things that need to be done in order to complete the saw. So I am happy that Pedder did the filing job for me. But just because a project is difficult doesn't mean that you shouldn't attempt to do it if you feel like it. There is also a special feeling in using a saw that you have made yourself, and that has to be taken into account too. If you count out the metal bending brake and the 25 ton hydraulic press, the rest of the project can be made with very few tools and in very little space. So the way I see it is that getting a kit is a cheap way to avoid a divorce and an eviction due to mounting a large hydraulic press. Just in order to make a bent saw spine. Elm handle, with character giving knot at the end. Large tenon saw with brass back. Do you remember to help other bloggers? Fueled by a casual remark from Brian Eve the other day, I revisited one of my old posts about blogging. I read all the comments again, and I remembered that it was a long time since I had done anything in the respect of updating my blog link list. The first new (to me at least) blog I found was by reading some comments on another blog. I held the mouse pointer over the name of the person commenting, and to my surprise there really was a blog to be found there. A bit of looking at this blog too, and I found another one that I hadn't come across before. The first blog is called "An Unplugged Woodworker". The second one is "The Apartment Woodworker"
So I'll ad those to my list of blogs that are out there for you to read. With the rehab of the Simpson saw out of the way, I felt confident enough to start on the tenon saw that I would make from scratch. Technically I had already started it while at home, with borrowed tools that we haven't got out here. At home I sawed it in half with the table saw. A positive thing was wearing safety glasses and ear protectors. A negative thing was wearing short sleeves. The blade threw some fairly large and very sharp brass chips at my right arm, so when I was done it looked as though I had been fighting in a thorn bush. Even my wife was impressed! I am still not sure if she was impressed by my stupidity or my manly looks with a perforated right forearm. I haven't got a metal bending brake, so I decided to ask our local fork lift dealer if I could use their equipment. Those guys are always incredibly helpful, so I bought a case of beer as a way of saying thanks for the many times they have helped me by letting me borrow a special tool. I can highly recommend to give them a call if you are even in need of a forklift or some service. It might help if you are in Denmark, as I am a bit uncertain if they do international service as well. But they just might. So N&V truck had a metal brake that I used for bending the two spines the initial piece of way. That way I had something like a V shape. I headed into the other part of their shop and aimed for the 25 tons hydraulic press. My idea was to gradually close the V to a nice spine for the saw. So I tried that with the first one. It was definitely not a success. By doing it gradually (lengthwise) the entire back ended up having a swoop upwards and a not very straight line. I was glad that I had a second chance. The next piece I managed to find some large steel bars that were so long that I could press the entire piece lengthwise in one operation. The most difficult thing however was to balance a V shape on the side with an 80 Lb steel bar on top, and not getting my fingers squashed in the process. There was remarkably little cursing and swearing in the process, but somehow it ended up looking really nice. I decided to take full advantage of the 25 tons of pressure available, so the spine was completely closed. It had seemed like a great idea at first, but once out here I realized that I wouldn't have a chance of getting the saw plate into the spine unless there was some sort of opening. Prying the spine open was quickly ruled out. I was simply afraid that I would ruin it. The logical step was to saw an opening all along the 20" of spine. This can be reasonably fast if you have a thin circular blade and a milling machine. It might even be a pleasurable job that way. grinding down a hacksaw blade to remove any set of the teeth, wrapping it in tape and using 2" of the length as a mini saw sure wasn't fast or pleasurable at all. But I got an opening for the saw plate without messing anything up. Filing and sanding the spine was uneventful and quite pleasant because it looked better and better for every change in grits. Getting ready to split the brass plate. Two spines, OK on the left, swooped and crooked on the right. Re-opening the spine with a hacksaw blade. I have earlier expressed my interest in building a boat on this blog, and I have slowly gathered information from books, blogs, etc. on the process of doing so. I even purchased a set of drawings for a small lapstrake tender (the "irreducible" by Weston Farmer) and believe it or not - I milled some larch for the project a couple of years ago, so it would be ready whenever I was. Before building a boat, you are supposed to loft the plans, which is a fancy expression for enlarging the drawings to full size on e.g. a piece of paper. Boat drawings come with something called a "table of offsets". These represent positions in a coordinate system, and then once all are plotted you connect those dots and that should give the finished plans of the boat. There is a small but important thing to notice about this dot connecting business though. The lines are not straight lines. So you need a flexible batten to help you draw that curve. Furthermore, the curve is not the same all along its length, so you will need something to hold the batten in place at various points while you adjust it, and then finally you can draw the line. Those things are known as drafting whales. (drafting ducks, lofting ducks or lofting whales are other names for them). For a couple of years I have regularly fantasized about casting a set of those. But I wasn't sure how to make a mold that would give a really nice result without trying to learn sand casting, and I didn't want to spend an enormous time on achieving anew skill for this. A thing that kept holding me back was that I had the idea that those whales had to look really nice. In a way this suddenly became vital for the positive outcome of the planned boat building adventure. I mean how could I ever present a boat that I had built unless the drafting whales used were perfect? Probably the majority of people who would ever see the boat would immediately demand to see the drafting whales I had used for lofting the plans! It wouldn't matter if the boat was pretty and tight etc. because clearly those whales were the most important part of it all. Actually the reason why people build boats was probably so they could use their drafting whales. Finally this time while at home I managed to get a grip on reality, and consider that maybe people wouldn't care if I had used a heavy stone, an old flywheel, a lead ingot or a horse shoe instead of a perfect whale when I laid out the lines. So maybe it would be OK to cast some even if they ended up less than perfect. It was a daunting thought! So somehow at a quarter past nine in the evening, I headed into the shop determined to try to make a wooden mold. A piece of larch was split in the middle on the table saw, and I quickly sketched the profile of a fat little whale on one side of it. On the adjacent side I sketched the outline as seen from below. Finding a sharp gouge and removing some material was also very fast. 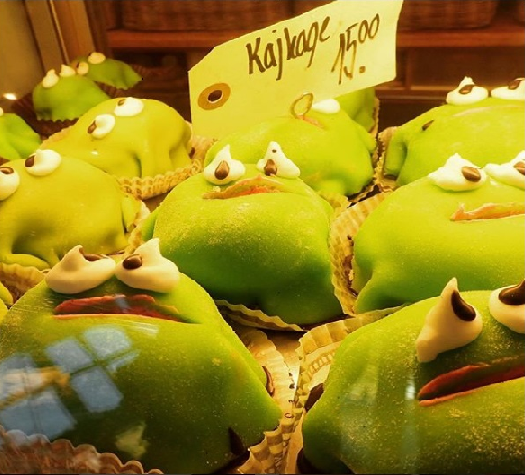 In very little time, I suddenly had half a mold. I held the two sides of the mold together, and traced the whale profile from the first mold to the second piece of wood. Removing the wood was just as quick, and in just a bit more than an hour I ended up with a decent mold. I couldn't believe that it had taken me several years to gather the courage to do it. The next day I melted some lead from old tire weights and some sheet lead that I had lying around. A 3" nail was bent and inserted in the mold. The two parts were clamped together in the vise, and I poured the lead in. The first whale casting caused a bit of bubbles, because of all the gas that would escape from the charring of the sides of the mold. The next casting was perfect until I opened the mold too soon.. It broke in two. After getting an idea of the solidifying time, I ended up making 10 whales. In the end the mold became more and more charred, so the whales started getting a larger and larger back fin. But it will be no problem to remove this with an ordinary knife. I plan on painting the whales after removing the surplus lead from them. But that will happen at some point while I am at home. First half of the mold. Mold clamped in the vise. The first whale is the one with a bit of color. Notice how the back fin gets bigger. Asger collects matchbox cars, and he has gotten himself a nice little collection. In order for him to organize all the small cars, we decided to build a couple of small display cabinets. The original idea was to not make the joinery complicated, so that he could help himself in nailing the cabinet together. The front frame is made with half lap joints which is then later glued and nailed to the carcase. The carcase itself is assembled using rabbets in the corners. For once I did something unusual. I actually bought the wood for the project. I purchased the best pine they had in the lumber yard, and I now realize how expensive it is to buy wood. But it is nice to work with something else than larch for a change, and pine smells so good when being worked. The back boards received tongues and grooves by means of a hand plane. That was just the right project for a child. The moulding on the back boards were also handplaned, Asger tried to plane one, but using the combination plane wasn't easy, so I finished the rest of them. The cabinets were finished with some spar varnish, and in a very short time they were both filled to the brim. Actually this project was completed a year ago, and it ended up in the "draft" section because I couldn't pull myself together to take a couple of pictures. Mind you, it was prior top me getting a smart phone! So before heading to sea this time, I took a couple of pictures, but off course there are none that will show the progress in the shop. Display cabinets made of pine. Door open showing bridle joint construction. Moulding detail on the door. Old Britains vehicles and detail of backboards. Rabbeted construction and half laps on face frame. 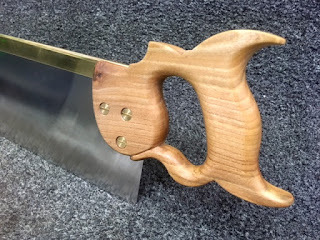 Simpson tenon saw 3, rehab completed. After letting the handle dry for a day, I mounted it on the plate. The mounting screws were a bit peculiar. I am not sure what thread is on them, but it seems incredibly coarse for the small diameter. It also only covers just enough to seat the nut for one turn. First I filed the holes square, so that the square shank of the screws could be inserted. After testing I ended up having to deepen the recesses for two of the screws with a bit, in order for the thread to be able to catch the nut. The blade went on without any problems, which was nice. The spine protrudes a bit on the front of the blade, but so it did before I took the saw apart, and I am OK with that. Pedder had filed the saw before sending it to me which was fantastic since he is so much better at doing that than I am. So It tested the saw a couple of times and it is a joy to use. It saws straight down without any tendency to wander off. The saw is really heavy, so there is no need to ad any pressure to get it to cut. It seems a bit heavy on the front, but given the length of 22" that is hardly a surprise. All in all I am happy with the result, and I like that saw. The size will make it great for bigger stuff like making tenons or dovetails on window frames and other large scale joinery. After testing the saw, I applied another coat of varnish to the handle. That way I figured that if had made any scratches in the mounting of the saw plate it would be fixed. Simpson tenon saw, elm handle. My fancy photo studio setup.